Update from Fr. Tom: In the last two weeks there has been almost continuous violence in Cite Soleil. Three of our students were shot as they walked to school. The guardian at our St. Veronica School was shot as well as several of our staff. Holy Week all the churches including the Catholic parish were closed. Hands Together had its Holy Thursday and Good Friday celebrations and celebrated Easter as well.There was absolutely no shooting for at least three hours while we had our religious services. On Holy Saturday, HT distributed 6,000 meals to the elderly and to those in desperate need. Pray for protection for our students and staff and that the violence would end. "I arrived in Port-au-Prince on Sunday after 59 angry men from Delmas were throwing rocks and chanting inflammatory things. Fr. Tom invited them into the chapel and gave each the equivalent of $6 and a rosary, then they left peacefully. Travel has been impossible till yesterday, as roadblocks were lifted. Fr. Tom & I are in no foreseeable danger at the moment. We have met several times with leaders in the Cite Soleil neighborhood. Schools remain closed and we are using this time to work on building projects which we will share soon in upcoming posts. School re-opened after the February incidents, but the atmosphere is still tense. At present we closed the school for a couple of days as the violence is happening again. We continue to trust God to protect us as He always has. We are grateful for all the prayers & notes of concern & folks reaching out. We are very good & filled with holy optimism. Thank you all!" "Yesterday Fr. Tom and I felt the deep satisfaction and teary fondness that comes with seeing students overcome the worst poverty and violence and finish their H.S. education with dignity and strength". 130 young men and women graduated from our Becky DeWine School and that is truly a miracle. This special day was quickly drowned out by burning tires, bullets, rock missiles, and total lawless unrest as the general population exploded in frustration over super high gas prices. The airport is closed and Tom and I may be stuck here a long time. Pray for us and for some relenting to the misery of a lawless, rapacious and hungry people. We are grateful that the rains subsided and the flooding has been alleviated. We are also grateful to the donors and friends who made special contributions to help with the clean-up effort. God Bless You! UPDATE: Rain is letting up and flooding is subsiding. Thank you to all of those who been donating to this emergency effort to clear the trash & debris! 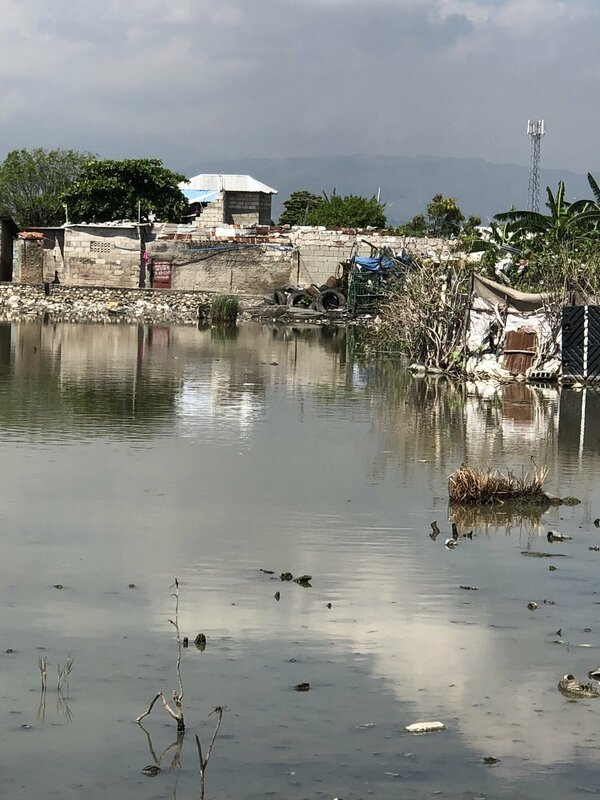 I left Haiti a few weeks ago and witnessed terrible misery created by heavy rains there. Fr. Tom called me to describe what has been happening. The rain begins to fall about 8pm and it is extremely heavy. In Cite Soleil the rain pounds on the tin roofs of the tiny houses. Within just a few minutes water begins to flow steadily into these dwellings making it impossible to sleep. 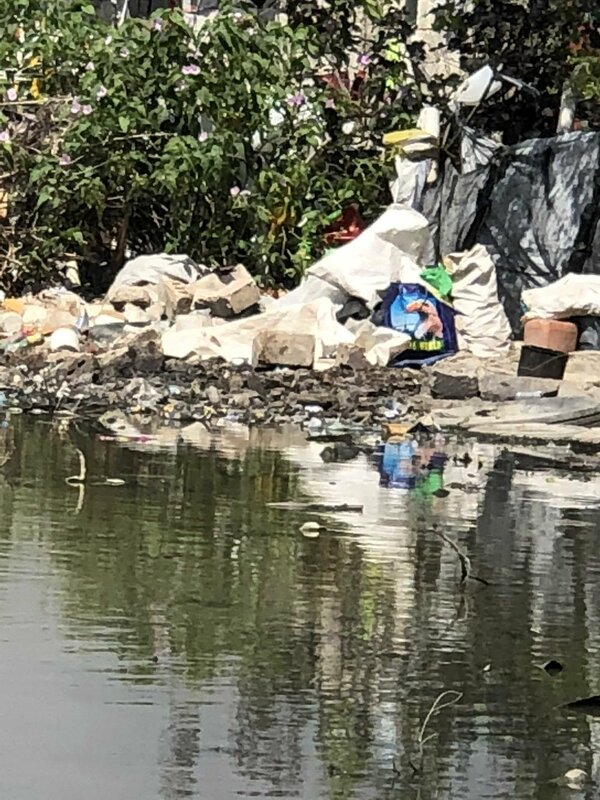 By midnight the rains begin to stop and what started as a stream of water up in the hils ends up as a flood of heavy mud carrying filthy garbage and debris rushing down the mountain into Cite Soleil burying the poor. By four or five in the morning there is thick mud everywhere mixed with sewage. Rats seem to be everywhere as they are forced out of their hiding places by the flow of the water and mud. By sunrise the entire area of Cite Solei is under water and there is a terrible smell. There is no government help! There is no police presence. There are no organizations doing anything. Seeing the tired eyes of mothers who have not slept for 2 to 3 nights because they must hold their children so they don’t drown, we knew we had to do something. Hands Together rented two large front end loaders for $900US a day. It is now the 6th day. Pray that this rain ends soon! We're happy to report the 2018 Annual Appeal booklet has been mailed out to our supporters. It shares what has been happening in Haiti and all of the projects that Hands Together has there. We are so grateful for the kind and generous support from our donors and friends. We can't do this without you! Fr. Tom and Doug send their thanks! This year's Golf Classic was a great success. The results are in and we’ve exceeded our goal, in fact we doubled it and raised over $150,000. Thank you to everyone who donated to the cause! Thanks to the generosity of Joe Taylor and Matrix Development group, the Hands Together Golf Classic has generated nearly 2.4 million dollars over the past 2 decades. All of these funds go directly to help the poor in Haiti. Matrix donates the course and food/beverage so that every gift goes to where it is needed most - the projects that help the children in the poorest slum of Haiti. The folks at Jumping Brook Country Club did a fantastic job as always! 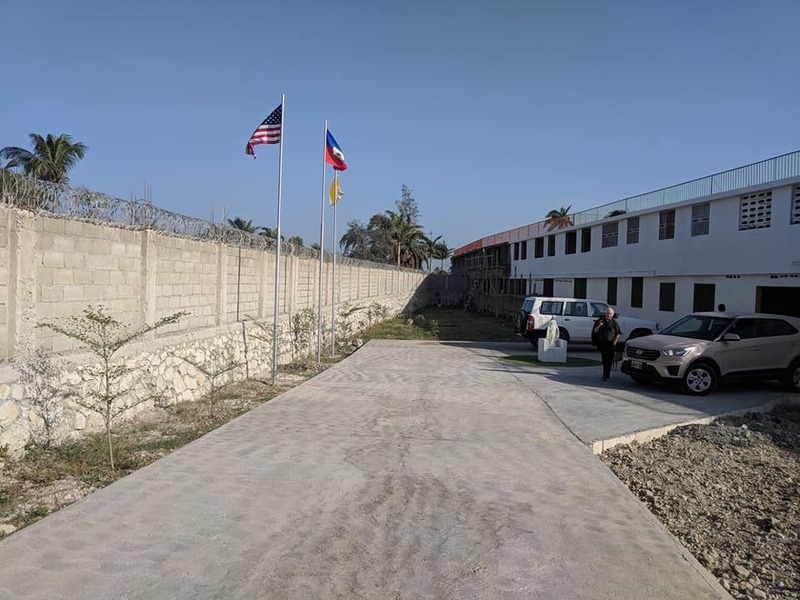 "Each one of you is loved by God"
Archbishop Eugene Martin, the Apostolic Delegate to Haiti representing Pope Francis, spent the day on March 9 visiting Hands Together's Becky DeWine School campuses and medical clinic in Cite Soleil. Our St. Francis de Sales student body welcomed the Archbishop with a vibrant assembly that included student performances, questions, and the presentation of a painting of Pope Francis. Responding to one student's question, "What is the mission of the Church? ", Archbishop Martin shared the following, "The mission of the church is to bring the good news and word of God to all people. It is to bring the Love of Jesus to people far and wide. Everyone one of us participates in this mission in a unique and special way. Each one of you is loved by God and called to share this love with all those you encounter." Archbishop Martin went on to tour the new computer center which gives our high school students access to 85 new laptops and a virtual library of 350,000 volumes. Then it was onto the state of the art soccer field which is such a blessing to all the children at our schools. Archbishop Martin got to see our students in action on the new artificial turf field. Our 12 health agents, who have been trained as paramedics thanks to the efforts of HT's Dr. Jim DellaValle, prepared a celebration to mark the opening of the clinic in Boston that had been closed for 2 years due to violence and instability. As Archbishop Eugene Martin stepped from the car, the people froze. They were mesmerized and speechless at the site of this tall, Irish clergyman in full dress, representing Pope Francis as he walked up to them and declared, "I come on behalf of Pope Francis, who would want to be nowhere else but here with you today." The crowd cheered and applauded as Archbishop Martin blessed all the rooms of our newly renovated medical clinic. Please join us or support us through this year's Golf Classic. We weathered one of the most violent and difficult years of our existence and through God's grace we increased our outreach to Haiti's poor and expanded our schools and programs. We really need your help this year to keep it all going. The event is held at Jumping Brook Country Club in Neptune, New Jersey - a top notch club with a great staff. If you don't golf or cannot take a whole day off, please consider coming to the dinner as dozens of friends and supporters do each year. This is more than a golf tournament, it is Hands Together primary public event where all our friends can come together and see Fr. Tom Hagan and share a little fellowship.